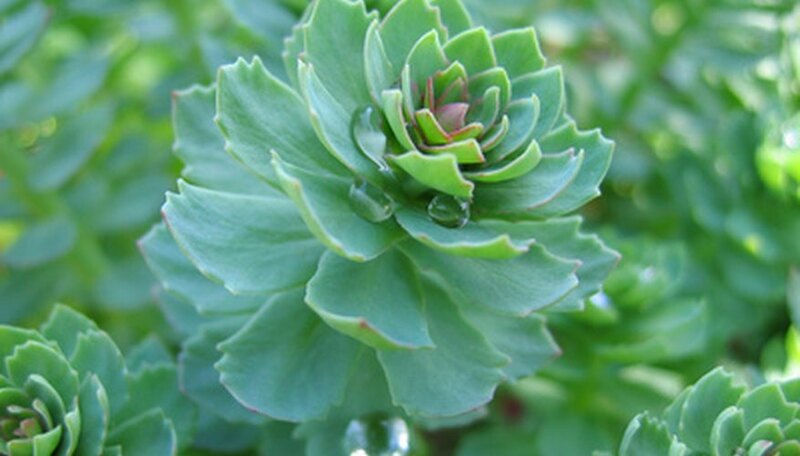 Rhodiola rosea belongs to the large family of Sedum plants which consist of over 400 species. Often called the Sedum rosea, the plant grows as a succulent that stores moisture in its fleshy, greyish-green leaves for periods of drought. It grows best in cold regions of the world, such as the Rocky Mountains of the U.S. and the Alps of Switzerland. It can also be found throughout Great Britain, Ireland, Iceland and Finland. The plant stands up to 13 inches tall. A dioecious plant, each Rhodiola rosea is either male or female. In order to achieve seed production, both male and female plants must be planted within a few feet of each other. Plant Rhodiola rosea in full sunlight to partial shade. For abundant blossom production, the plant prefers full sunlight. Yellow blossoms appear in May and persist into the summer months. Choose a planting location that offers well-draining soil. Mix ample aged manure into the soil until it feels crumbly to the touch. Add several scoops of gravel or vermiculite to the soil to increase its porous ability. Rhodiola rosea does well when planted in soil that contains gravel or rocks. It is a popular rock garden plant. Plant seeds at a depth of 1/2 to 1 inch in either the fall months or in the early spring. Rhodiola rosea seeds must have a period of cold stratification before germination can begin. If planting in the spring, the seeds should be stored in a refrigerator for one month prior to planting to achieve successful germination. Germination occurs 40 days after planting the seeds. Plant rhizomes 2 inches below the soil's surface in the early spring. Ensure that the rhizome has at least one bud on it prior to planting. The bud appears as a nob or bump on the fleshy roots service. The rhizomes will begin to produce foliage three weeks after planting. Keep the soil moist to the touch but not overly water-logged. Remove weeds as they appear. Harvest Rhodiola rosea roots in the fall when the plant is 5 years old. Dig the roots out and divide. Take the largest roots to be processed into herbal supplements. Replant the smaller rhizomes for future harvest. Rhodiola rosea grows best in USDA hardiness zones 1 to 6. Propagation can be achieved from seed or root division.